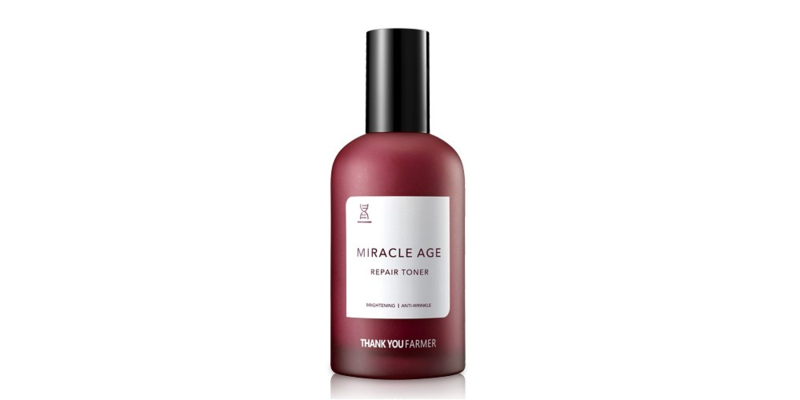 The Thank You Farmer Miracle Age Repair Toner claims to be a smooth, rich milky toner that combines the function of toner, serum and emulsion in one product. It boasts a concentrated texture for rich moisture and nourishment to bring radiance to rough, lifeless skin. Labelled as a brightening and anti-wrinkle treatment, there are certainly ingredients that bring these properties to the toner. None more so than Niacinamide (Vitamin B3). According to dermatologist Dr Sam Bunting, niacinamide boosts barrier function by increasing ceramide production. 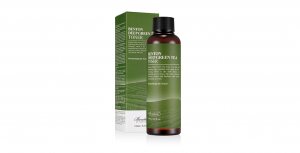 This improves water-retention, protects against environmental stressors and results in better overall skin structure. Anti-inflammatory properties make it effective against acne while its ability to inhibit melanin production also assist to create even skin tone. There are several botanical extracts that offer a strong antioxidant boost to help protect the skin from environmental stressors and also contribute brightening and antiageing benefits. These include Black Hoof Mushroom, Purslane, Burdock Root, Kudzu Root, Peony Root, Licorice Root and Marsh Parsley Root extracts. Argan oil contains unsaturated fatty acids and tocopherols to improve skin suppleness, softness and elasticity. It also regulates sebum production which can prevent acne breakouts. Antioxidant activity is delivered through the Vitamin E content in argan oil which assists to repair and renew cells that in turn can result in the fading of acne scars. Similarly, Squalane is a richly moisturizing anitoxidant with replenishing fatty acids. Being an anti-ageing product, there are no surprises to find some key wrinkle fighting ingredients within the formulation. Adenosine is a yeast-derived soothing and skin-restoring agent with proven anti-wrinkle benefits due to its ability to energize the skin’s surface to make it look smoother and younger. Palmitoyl Pentapeptide-4, also known as Matrixyl, a fatty acid mixed with amino acids manufactured by French lab Sederma, offers similar anti-wrinkle benefits. Decreasing with age, both Cholesterol and Ceramide 3 are important for healthy barrier function. Helping to to retain moisture and shielding against bacteria and environmental pollutants, they protect against dryness, redness, itchiness and irritation. Soothing effects are delivered through the anti-inflammatory properties of Aloe Leaf Juice, while humectants such as Glycerine, Sodium Hyaluronate, Panthenol and Betaine draw water from the atmosphere and help reduce hydration loss by reinforcing the skin’s outer layer. 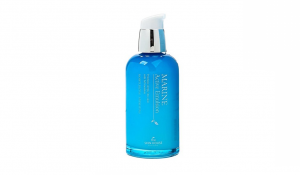 A good concentration of emollients are incorporated into the formulation to deliver skin replenishment. The main ones are Caprylic/Capric Triglyceride which is derived from coconut oil and glycerine and Dimethicone. 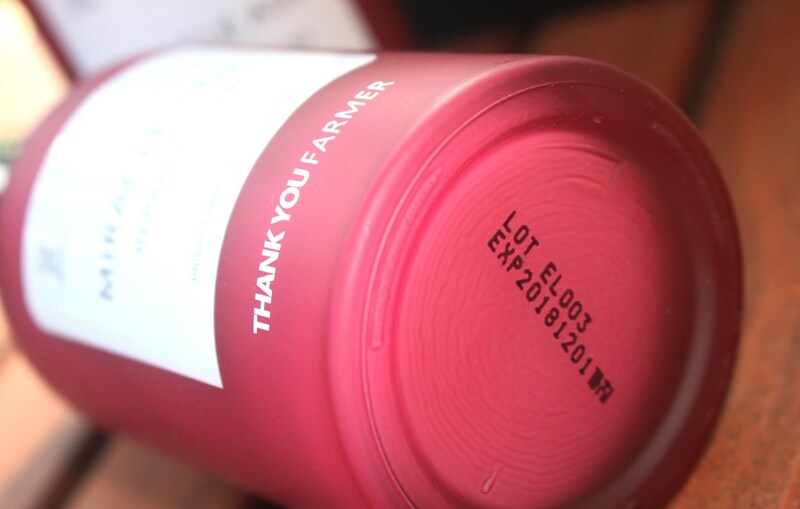 The Thank You Farmer Miracle Age Repair Toner comes in a heavy, wine coloured glass bottle with plastic black pump dispenser and lid. Running the ingredients through the CosDNA and EWG databases, returns a mild hazard rating with most of the 49 ingredients returning zero warnings. As expected, the additions of fragrance and preservative raised warnings. The presence of Sodium Laureth Sulfate (SLS) raises a warning flag due to its high sensitizing nature. 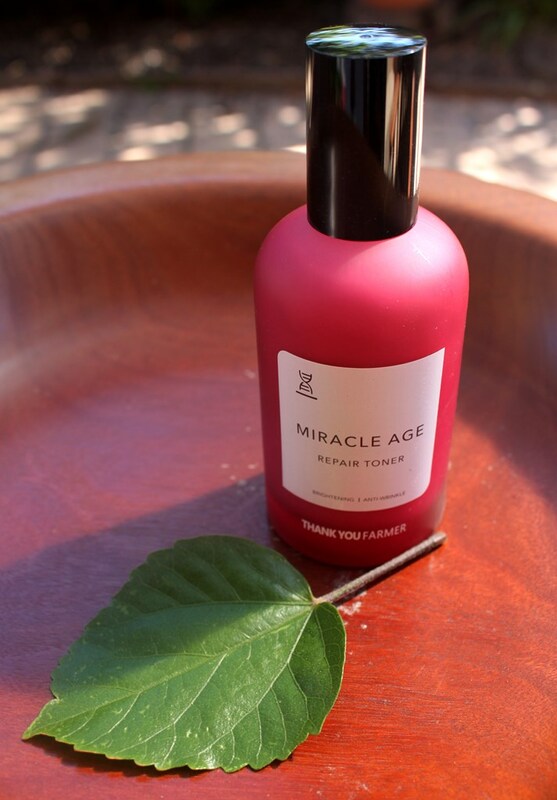 Apply the Thank You Farmer Miracle Age Repair Toner with a cotton pad after cleansing, softly washing from the inside to the outside of your face. Press and tap the product into the skin. It can also be soaked into cotton mask pad and placed on the face for 5-10 minutes to deliver a masking effect for enhanced moisturisation. 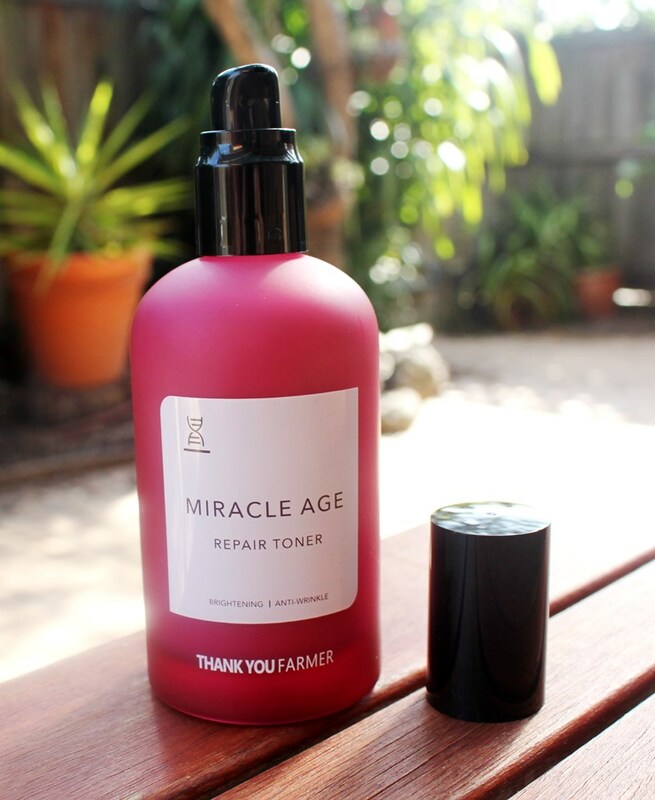 The Thank You Farmer Miracle Repair Age Toner has a light floral scent, said to have jasmine and calendula undertones. The Thank You Farmer Miracle Age Repair Toner has a recommended retail price of approximately US$36.00. 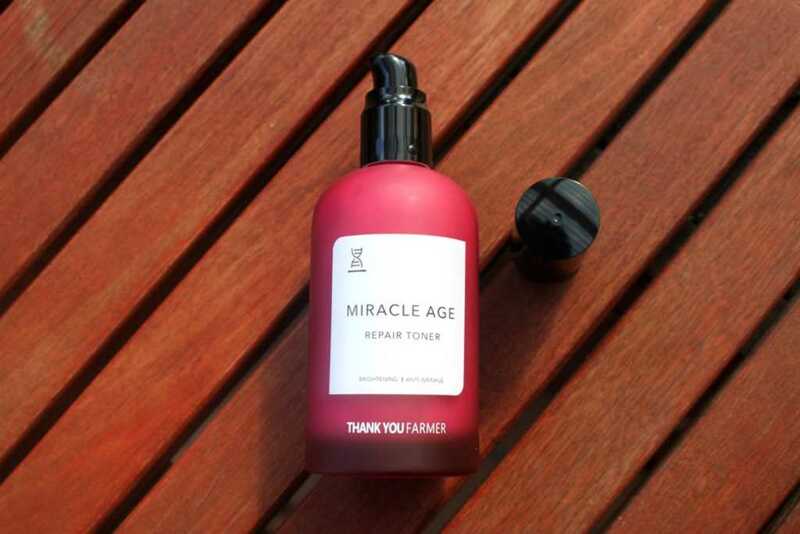 The Thank You Farmer Miracle Age Repair Toner is available at Korean skincare boutiques. I picked mine up from Style Korean. The product must be used within 12 months of opening. First impressions are definitely positive, reinforced by a weighty and sophisticated glass bottle with typical minimalist Thank You Farmer labeling. The cap is removed to expose the hygienic application. The wine coloured frosted glass effectively protects the contents from light degradation while also allowing you to see the level of remaining product and the pump action minimises the possibility of air and contact contamination. 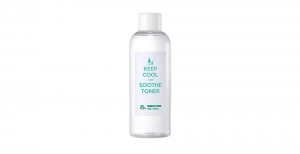 This toner has a light floral scent which is contributed by added fragrance. I am not an advocate for complicating a formulation with added components simply for the sake of enhancing scent however this is quite subtle and doesn’t bother me. The toner is thicker than most, not watery in the slightest. It has a milky consistency and appearance. The rich viscosity feels quite luxurious on the skin. Although the instructions suggest cotton round application, I prefer to use the warmth of my hands to pat it in directly. It seeps into the surface effortlessly, very quickly absorbed without sticky or tacky residue. I use around 3 pumps per application to cover my face and neck. Thank You Farmer have marketed this product as a three-in-one toner, serum and emulsion. To recap, a serum and emulsion are applied after cleansing to deliver concentrated ingredients directly into the skin to combat a specific skincare concern (in this case wrinkles) and light lotion-like moisturisation respectively. Oddly enough, the Miracle Age Special Edition Set that I purchased, promotes the toner and emulsion as complementary treatments. Regardless, this review is an assessment of the toner only (the emulsion will have a dedicated post at a later date). Indeed, my skin does feel the effects of moisture and hydration when using this product but I saw no proof of it working effectively as an anti-ageing serum. My suspected reasons are included in the discussion below. Also, as it is quite thick and more complicated than most hydrating toners, I wouldn’t recommend it layered in multiple skins. I don’t believe it is a suitable option for 3, 5 or 7 skin methods. After application, skin feels instantly refreshed and nourished, not unlike the feeling of a lotion on the face. Together with a moisturiser that follows, the hydrating benefits appear to last until the next application. My skin additionally feels smoother, soft and supple, results promoted by the inclusion of fatty acids, humectants and emollients in the formulation. Few words are printed on the label but clearly pronounced are brightening and anti-wrinkle. The anti-wrinkle claim is a little difficult to justify as products really need to be applied over a long period to gauge their anti-ageing performance. The company states that this product actually improves wrinkles. I have been using the toner consistently, twice a day for approximately one month and failed to see any improvement. The key anti-wrinkle ingredients, adenosine and matrixyl, appear to be included at low concentrations which also makes me doubt their effectiveness. Similarly, cholesterol and ceramide 3 are also poorly represented so their contribution towards building a healthier skin barrier is also likely to be negligible. However, I don’t question the antioxidant strength of this product which ensures protection against environmental factors that can lead to premature ageing. So as a minimum, I would say that this toner certainly provides preventative wrinkle effects however would have no effect on existing lines. Brightening ingredients on the other hand appear to be included at effective levels from ingredients such as niacinamide and several botanical extracts. As I also use other brightening layers in my routines, it was difficult to attribute any such effect to this one product. The science certainly supports such results even though my trial was inconclusive. 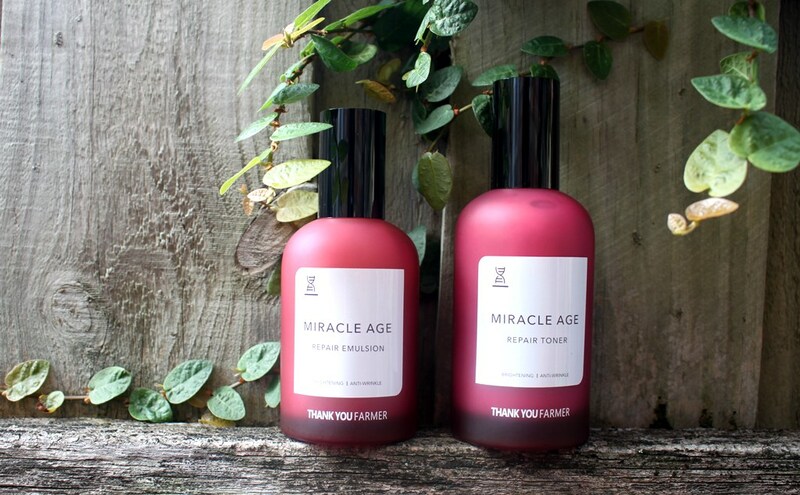 The Thank You Farmer Miracle Age Repair Toner is a lovely product. It applies seamlessly and hydrates efficiently. It may satisfy the claim of toner-serum-emulsion function where only a light routine is needed, such as in the height of summer when multiple layers can be overly occlusive. However, I found it too light to effectively deliver on all three counts consistently. Also, I think its ability to repair the skin through wrinkle softening and barrier strengthening is not convincing since the ingredients responsible for such behaviours are incorporated at such low concentrations. Perhaps a more accurate descriptor inspired by its antioxidant strength would be Protect rather than Repair. So although no repairing effects were observed, it does provide good protection against premature ageing and a satisfying level of hydration. Thank you for this review. I purchased this product recently when I decided to reintroduce steps back into my routine (I’ve grown a little lazy in the last two years). There’s very little out there about this product, and much of it is marketing verbiage. The packaging, while beautiful, is written in Chinese characters, which I have no hope of ever understanding. And while I don’t necessarily agree with your final opinion about the product (I LURV it! ), I so appreciated your in-depth, non-biased review. I love that you talk about the look, the feel, the packaging and maybe best of all, the ingredients and why they matter. That saves me so much time searching and cataloging and comparing. You take the time to let the product work and are mindful of, and let us know about, other products you are using at the same time, giving your opinion about how they may or may not affect the outcome of the product being reviewed. Obviously, I’ve gone through and looked at some of your other reviews. Based on your reviews, there were a couple of products that I immediately purchased or plan to purchase. BTW, I used your links to do this. Don’t know if that helps support your blog or not – hope so! Finally – your discount section. Wow! I got some seriously GREAT deals and made purchases (and re-purchases) I hadn’t planned on (the limited time deals on the Timeless Skincare site we just too good to pass up!). So, again, thank you. I wish there were more product reviews already out there, but I completely get why they aren’t. Please keep up the great work. Thanks Lissa for taking the time to provide such detailed feedback. It’s always helpful and encouraging to receive. I’m glad you got some value from the content and I appreciate you using the links for purchase, it helps with the upkeep of this blog. And by the way, I’m still using this toner 1-2 times a day (around a quarter left now) and have yet to see any wrinkle reduction. Great hydrator though as originally concluded. Keep enjoying your extended routine. Yikes! It was the Style Korean website that offered the amazing limited time deals, not Timeless Skincare (although I went there too and made a purchase). Keep an eye out for Timeless 50% off deals – they usually coincide with major US holidays like 4th July, Valentines Day, Christmas, Thanksgiving etc. They offer everything for 50% discount with a minimum US$75 spend. I stock up during these sales as they are such good value.